Brad McClure scored twice and Cody DePourcq netted the winning goal in the third period as the Penticton Vees edged the Surrey Eagles 3-2 in Game 3 of the Fred Page Cup Final on Monday night at the South Okanagan Events Centre. Nic Pierog and Brady Shaw found the back of the net for Surrey in a losing cause. The Eagles are up 2-1 in the best-of-seven series. The teams traded chances and goals in the opening period. Penticton got on the board first when McClure wired a wrist shot past Michael Santaguida from the right circle on the power play to put the home team ahead. The Birds responded though when Pierog found the back of the net off the rebound of a Jordan Klimek point shot to tie the game at 1-1. A few minutes later, the Eagles were given a power play when Thomas Nitsche was called for hooking, but it was the Vees that took the lead as McClure scored shorthanded with another well placed wrister off the rush. Surrey wasn't deterred though as Shaw equalized before Nitsche's penalty expired, burying a garbage goal from in front of the net. Both teams had some notable opportunities to move in front in the second, but neither side was able to get the go-ahead goal. Wade Murphy hammered a shot off the cross bar from the high slot in the early going while Brett Mulcahy nearly scored for Surrey, but Chad Katunar stopped him on a good chance in front of goal. Katunar was pressed into action again later in the period, making a nice save on Shaw off the rush, and Murphy found the iron again for Penticton when he hit the post with a hard shot from the left wing. Colton Mackie came close for Surrey in the third when he forced a turnover in the Penticton end and got a shot away, but Katunar turned Mackie aside and stopped Pierog on the rebound as well. DePourcq scored the eventual winner on a two-on-one after a nice pass from the left boards by Travis Blanleil to find him alone in front. The Birds tried to battle back in the game, but their comeback attempt was thwarted when Craig Wyszomirski was called for interference with less than three minutes remaining, limiting Surrey to a five-on-five scenario when they pulled Santaguida. Penticton went 1-for-4 on the man advantage while the Eagles were 1-for-2. The Vees finished ahead on the shot clock for the third straight game, firing 40 shots on Santaguida as opposed to Surrey's 28 shots. Game 4 goes on Tuesday night at the South Okanagan Events Centre. Face-off is at 7:00pm. The two teams will return to Surrey for Game 5 on Thursday night. For tickets, call the Eagles office at 604-531-GOAL (4625) and help the Birds defend the nest. 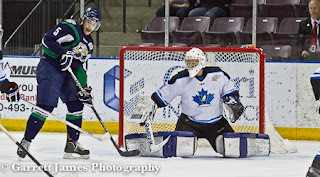 Highlights courtesy of the Penticton Vees and the South Okanagan Events Centre.